Students with communication difficulties need skills to communicate functionally in everyday situations, without the usual support and protection from home and school. These skills need to be explicitly taught, to enable them to become confident young adults. SmiLE Therapy is an innovative therapy designed to equip students with the skills necessary to become responsible individuals who operate at the highest level of independence that their circumstances and condition allow. Teachers and speech and language therapists have always included functional life skills practice in their work with students. Now, for the first time, they can do so using a therapy with a proven method that has demonstrable outcomes. 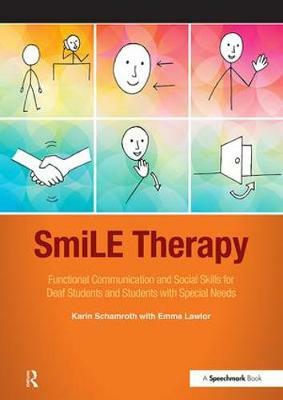 This book is a practical step-by-step resource, designed to guide teachers and SLTs in the delivery of SmiLE Therapy with students who have communication difficulties due to deafness, specific language impairment, learning difficulties, autism or physical disability. It includes a clear step-by-step approach to preparing, running and evaluating SmiLE Therapy, with photocopiable resources and clear outcome measures from each module to share with parents, staff, education and health managers. "SmiLE Therapy is the product of a considerable amount of clinical experience and the authors have begun to develop a small evidence base for its effectiveness with deaf pupils at primary and secondary level, with a further study underway with autistic students. This highly practical resource will be valuable to speech and language therapists and teachers interested in developing functional life skills in their students with communication disabilities. As well as extending the SmiLE approach to a wider group of practitioners, publication of the programme brings with it the opportunity for further research investigating its efficacy with different client groups." - Dr Rosalind Herman, Language & Communication Science Division, City University, London. "This programme does not focus solely on the mechanics of communication skills, but has a clear focus on building young people's confidence and resilience to help them develop a robust and positive self-image... Although designed for use primarily with students with a hearing impairment, I feel the materials and approach presented here would also be of value for students who have a specific language impairment or who are on the autism spectrum. This clear and accessible resource will be of benefit to many SEN teachers." - Martin Edmonds, SENCO, runs a specialist provision for students with a diagnosis of autism. "I was particularly impressed by the emphasis the authors place on "supported generalisation"- ensuring that the skills acquired in smiLE therapy sessions are carried over into home and school life. The smiLE test- teach test approach means that outcomes from the sessions can be easily documented, providing the practitioners with evidence of the success of the intervention.